green cover (GB) Your browser does not support any audio element. enherbement (F) Your browser does not support any audio element. inerbimento (I) Your browser does not support any audio element. Designation for the deliberate sowing and / or permitting of suitable plants in the vineyard between the Rows of vines, This measure is under the Organic viticulture at the biological or. Integrated pest management almost obligatory. A greening protects against erosion, favors the formation of humus, enriches the microbiological soil composition by organic nutrient, creates positive water competition to the vines and thus yield reduction, ensures a better water storage and water discharge and thus optimal water balance, reduces the nitrate leaching, causes less susceptibility to diseases such as chlorosis. fungal diseases. stem necrosis and Verrieseln, reduces the amount of mineral fertilizer required and provides food supply for beneficials like insects and birds. Typical vegetation plants are various types of grass (bermuda grass, bluegrass, fescue grass, perennial grass, ryegrass), yellow mustard, cumin, alfalfa, lupins, mallow, clover, oil radish, phacelia, rapeseed, vetch, vetch, meadow button and cereals (barley, oats, rye, wheat ). The plants have different effects, the respective selection has targeted depending on soil type, desired effect and water balance. In the trade different seed mixtures are offered in this regard. For dry soils, short-rooting plants are preferred so as not to remove too much moisture from the vines. If there is a tendency to waterlogging, deep-rooted plants with a high water requirement, such as yellow mustard, are used. For nitrogen-poor soils legumes (Legume) sown, the nitrogen tie it from the air and bring it to the ground. The plants should by no means "hosts" for the virus-transmitting nematodes represent. Either the pests should not be able to exist on them (non-hosts), or at best like the oil radish have a damaging influence (enemy plants). After a soil analysis by the EUF method as well as taking into account the water balance, the appropriate seed mixture must be selected. To a certain extent, too weeds (Beikräuter) fulfill certain functions of a specific greening and are therefore at a ecological Management partially tolerated. Greening takes place either in the form of a dry seed or, in the case of larger areas, by means of wet seedling (greening of plants). As a rule, only every second lane is greened. A necessary fertilization then takes place in each case in the open lane, because the nutrients thereby reach the roots better and a Bedüngen the greening would stimulate their growth too strong. The perennial permanent greening (also mulch), is mainly used in yield plants. Thereby perennial (long-lived) plants are sown. During the growing season must be mowed several times to limit the water consumption of the vegetation plants. This should usually be done with a height of 15-20 centimeters. Depending on the amount of rainfall and green plants, as well as the location, this results three to seven times a year. The used Shredders Not only mow the plants, but crush them and spread them on the ground (mulching). 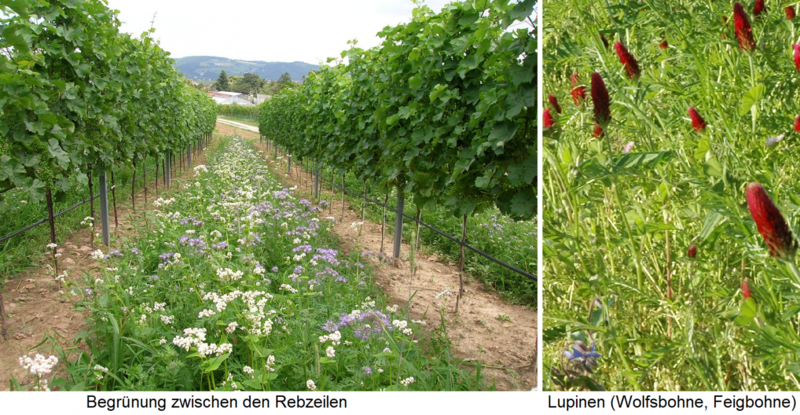 It is mitzerkleinert also by various vineyard work lying on the ground Rebholz. Due to the rotting of the mulch compost Nutrients are supplied to the soil. A short-term greening (also green manuring or part-time greening) with one-year, that is short-lived plants is mostly used in young plants. It serves to enrich the vineyard soil with nutrient humus in preparation for permanent greening, as well as when using legumes for the purpose of nitrogen supply. The sowing takes place in spring or early summer, the rotting and nutrient supply until the following year. This page was last modified at 27 October 2017 at 09:50.